In the previous installment, Stalin has proposed before Churchill and Roosevelt at the Teheran Conference in November 1943 that at least 50,000 German “war-criminals” must be executed by firing-squad after the war. As suddenly as he had risen, he slumps back into his chair. b) that the pronounced sentences be carried out. The will for revenge in a guise of legality was even more pointedly expressed on 7 May 1942. That was the occasion of the founding of the “Inter-Allied Commission for War-Crimes,” which was supposed to gather incriminating evidence and to draw up lists of “war-criminals” – consisting only of Germans, of course, not of Italians and Japanese. The American Under-Secretary of State Cordell Hull, the British Foreign Minister Eden, and the Soviet Foreign Commissar Molotov determined the text. 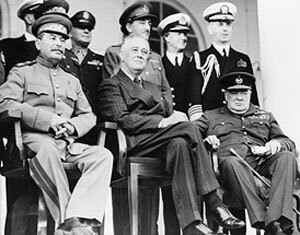 “The Big Three” signed the document: Roosevelt, Churchill, Stalin.